The Main Bar Area is located on the first floor of the venue. It has a large bar, dancefloor and our DJ booth. You can book a table in the main bar for 10-50 guests with the latest arrival time of 9pm. 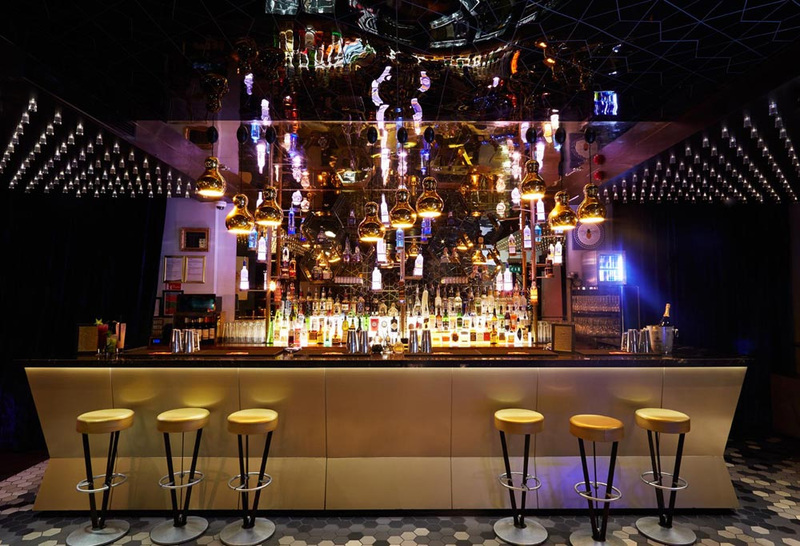 The main bar is perfect for those who want to be right in the action with our fantastic sound system and lighting effects! The main bar closes at 3am on Friday and Saturday nights making Golden Bee a fantastic choice for a late night celebration! Sushi platters are available to pre-order for your table. These must be ordered and paid for 48 hours before your booking. You can see the menu HERE. 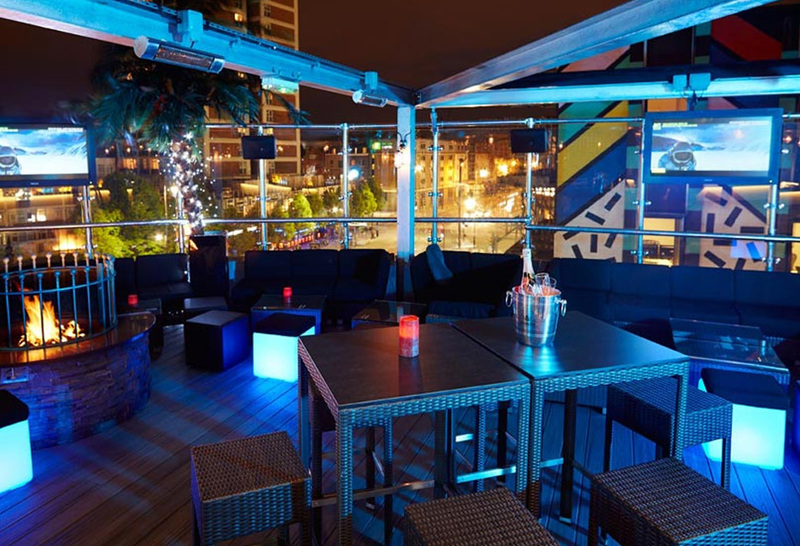 Please note that a booking in the Main Bar will not guarantee you access to the roof terrace. Please go to Book Now and choose Main Bar to make your booking! 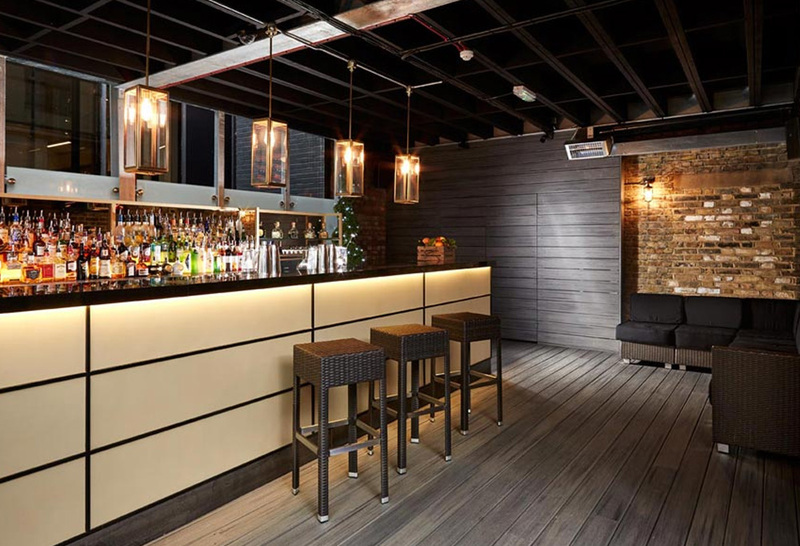 Our Rooftop Terrace is situated at the top of the building with fantastic views of the surrounding Shoreditch area. The rooftop has its own bar serving up seasonal as well as classic cocktails! The rooftop has heaters to keep you warm on those cooler evenings plus we give out blankets to those feeling chilly. With speakers situated around the entire rooftop you are able to enjoy a cocktail whilst listening to the DJ playing downstairs in the Main Bar. After our renovation we now have a retractable canopy so the roof can be enjoyed throughout the year come rain or shine! We take bookings on the roof terrace for 10-40 guests with the latest arrival time of 7.30pm. The roof terrace closes at midnight due to our license however all our guests are welcome to join the party in the Main Bar downstairs until late! Please go to Book Now and choose Roof Terrace to make your booking! 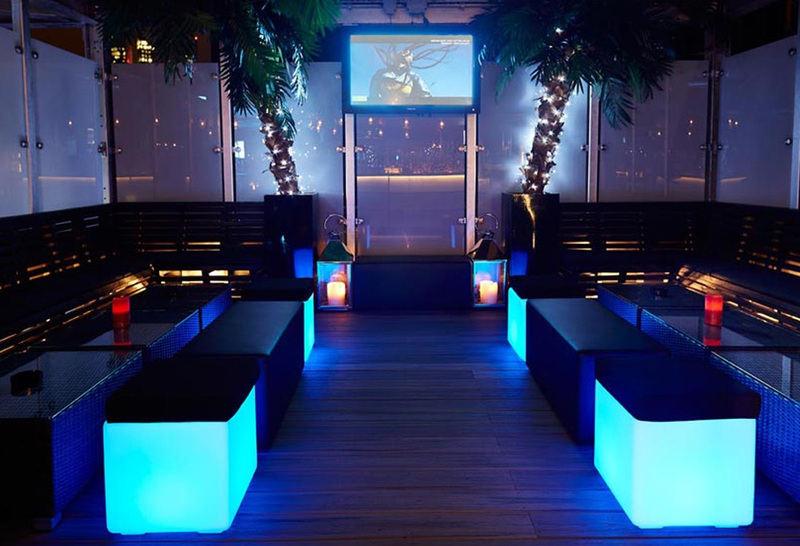 Our brand new VIP area is located on the Rooftop Terrace and can cater for 10-50 guests. Arrival time for this area is between 5pm and 8pm. The Roof Terrace will close at midnight due to our license however all our guests are welcome to join the party in the Main Bar downstairs until late! The VIP area will give you a private area on the Rooftop with the option of wristband entry for your guests. You will benefit from your own security for the night to ensure only members of your party are in this area. You will also have direct and private access to the bar with table service available for BOTTLES ONLY. We have different food options available including sushi and canapes. This area incurs a minimum bar spend depending on the day of the week. Food is additional to the bar spend. Alternatively, please go to “Book Now” and choose VIP Rooftop Terrace to send us an enquiry and someone from our events team will get back to you! After our major renovation we now have a completely new area to offer! The Mezzanine is situated in between the Main Bar and the Rooftop Terrace. It has its own brand new fully stocked bar along with some comfy seating and bar stools for you to enjoy a cocktail. The Mezzanine is available for private hire throughout the week for 15-30 guests. Minimum spends vary with the day of the week and we can offer various food options (food is additional to minimum bar spend). Arrival time for this area is between 5 and 8pm. The Mezzanine closes at midnight but guests are welcome to join the party downstairs in the Main Bar until late. Booking the Mezzanine exclusively gives you a private area with your own security to control your guest-list. You benefit from having your own bar and large TV screen should you wish to have any presentations. The Mezzanine is perfect for corporate clients looking for a more private experience within a fun and exciting venue! We can also tailor cocktail menus to suit your wishes. Please note that booking the mezzanine level will not give you the access to the roof terrace.